One of America’s finest singing actresses, soprano Amy Johnson exhibits a unique combination of versatility, stage magnetism and striking physical beauty, able to portray youth yet having ample vocal brilliance and power to soar over the largest orchestra. The aforementioned versatility can be affirmed by a glance at her extraordinarily wide-ranging repertoire – the title role in Salome, Giorgetta in Il Tabarro, Tatyana in Eugene Onegin, Donna Anna in Don Giovanni, Alice Ford in Falstaff, Freia in Das Rheingold, Fiordiligi in Cosí Fan Tutte, Rosalinde in Die Fledermaus, Mimi in La bohème, the title roles in Aïda and Madama Butterfly, Marguerite in Faust, Donna Elvira in Don Giovanni, Desdemona in Otello and Santuzza in Cavalleria Rusticana. She has performed these roles throughout the world in such companies as Vlaamse Opera in Antwerp, New York City Opera, Indianapolis Opera, Portland Opera, Austin Lyric Opera, Toledo Opera, Orlando Opera, Virginia Opera, Opera Tampa, Knoxville Opera and Piedmont Opera. 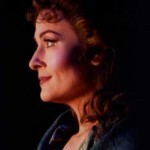 Ms. Johnson has earned special praise for her portrayal of the title role in Puccini’s Tosca, which she has performed nearly 100 times with Glimmerglass Opera, New York City Opera (also broadcast on PBS’ Live from Lincoln Center), Palm Beach Opera, Michigan Opera Theater, Spier Festival in South Africa, Arizona Opera, Nashville Opera, El Paso Opera, Kentucky Opera, Opera Santa Barbara, Greensboro Opera and many other organizations. Recently Ms. Johnson’s acclaimed portrayal of Salome was aired over Iowa Public Television in a vivid new production by Cedar Rapids Opera, and she was invited to return for the opening of the CRO season (in the brand new Coralville Center for the Performing Arts) with a recital broadcast over Iowa Public Radio. Other recent activities include appearances with both Orquesta Sinfonica de Xalapa (Mexico) and the Cheyenne Symphony, Beethoven’s Symphony No. 9 with the Glacier Symphony in Montana, opera galas with the Springfield and Kentucky Symphonies and the CCM Philharmonia (featuring excerpts from Die Walküre and Tristan und Isolde conducted by Mark Gibson),Tosca for the festival Musica e Musica in Italy, Freia in Das Rheingold co-produced by Indianapolis Symphony and Opera, Handel’s Messiah with both the Galion (OH) Community Chorus (60th Anniversary Gala with members of the Mansfield Symphony) and ProMusica Arizona, and a number of other concert and recital dates centered on the operatic and song literature of Wagner, Verdi, Strauss, Charpentier and Korngold. Most recently Ms. Johnson created the role of Finola Daley in Eric Sawyer and Harley Erdman’s The Garden of Martyrs, produced in collaboration with the Springfield Symphony and the Northampton Academy of Music, for which she received particular acclaim. Last spring she appeared at Vassar College to reprise an earlier project – Jon Chenette’s challenging song cycle Oh Millersville!, based on a series of poems about her native Iowa. Ms. Johnson recorded her first solo CD, Amy Johnson – Red, White and Blue: Arias of the Passionate, Pure and Perverse, with the MAV Symphony of Budapest, to be released on the Hungaroton label. Ever expanding her artistic and vocal horizons, Ms. Johnson collaborated with the Kentucky Symphony in creating Twisted Sisters – a fully staged evening of operatic “mad scenes” performed with orchestra, incorporating interactive projected film images in excerpts from Lucia di Lammermoor, Mefistofele andSalome. International recognition first came to Ms. Johnson when composer Thea Musgrave personally chose her to create the role of Manuela in the world premiere of Simón Bolívarfor Virginia Opera, subsequently reprised in London (BBC Proms at Royal Albert Hall) and in Glasgow and Edinburgh (Scottish BBC). She made her Carnegie Hall debut (Beethoven Symphony No. 9) in a benefit for the South Asia earthquake victims. Other orchestral appearances include the West Virginia Symphony, Evansville Philharmonic, Springfield Symphony, Long Island Philharmonic, Winston-Salem Symphony, Rockford Symphony, Cayuga Chamber Orchestra and Kentucky Symphony. Ms. Johnson was a founding co-principal of Impresario Productions, LLC, a production company specializing in innovative, cost-effective ways of producing operas, concerts, and galas. She also served as co-founder and Artistic Director of The Professional Advantage, a summer opera and language training program in Italy. She was a voice faculty member and Opera Workshop Program Director at The University of Massachusetts-Amherst from 2008-13, and currently serves as Assistant Professor of Voice and Co-Director of Undergraduate Opera Workshop at the College-Conservatory of Music of the University of Cincinnati. Ms. Johnson is a graduate of Grinnell College and holds a Masters degree from Manhattan School of Music.